Sci-Fest, the popular fund raising family friendly sci-fi event suitable for all ages, returns to the Baths Hall for 2018. We’ll be travelling back in time with Scott Goodman as the third Doctor, so expect to see him with the TARDIS keeping us safe from the daleks. The ever popular Sentinel Squad UK will be returning and young Padawans will be thrilled with the new Jedi Academy. Star Warz for hire will be bringing some great props for photo opportunities. Young science fans can try some real “hands on” science activities with the award winning Lab Rascals. Krash Labs will be have lots of Minecraft and coding activities running throughout the day. 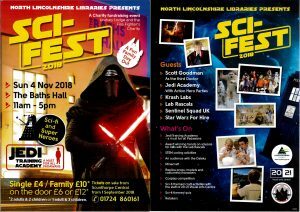 Tickets are on sale from at the Central Library, or online https://northlincs-self.achieveservice.com/service/sci_fest_tickets . Tickets are priced at £4 single ticket or £10 for a family admitting 4 people if they’re bought in advance. On the door prices are £6 or £12. 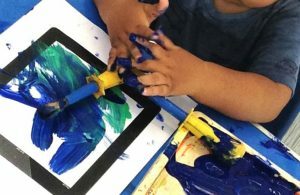 These sessions are full of creative fun for the under fives at 20-21 Visual Arts Centre. We offer painting and crafts, sand and water play, puzzles, puppets and much more! Stick and splodge sessions are just £1.00 per child and run every Thursday morning from 10:30am – 12 noon. There is no need to book, so just drop in and have fun. Craft activities for people aged 16+ who have a disability.